This drawing isn’t officially a representation of a scene from the books, since there is no direct evidence that this event happened; from Septon Barth description of the events following Pricess Aerea return to King’s Landing, it is though higly suggested, in my opinion, that indeed during the time of her disappearence, Princess Aerea was in fact brought by Balerion to Valyria. The girl stole a dragon, the biggest of them all, and the only one living, at that point in time, that was born in the now disappeared peninsula of Valyria. I think the dragon had a will of his own, I think the little girl, though connected somehow to the beast, didn’t had enough authority to impose completely her way on the dragon. There’s also the possibility that Aerea didn’t even had a plan or destination in her mind when she decided to fly away from Dragonstone; she might even have been satisfied of letting the dragon decide where to go, the main thing for her was just to get away from her mother and the boredom of the ancestral Targaryen island. When Balerion arrived in Valyria, maybe following his own instinct and a pull to his own place of birth, everything was broken and in ruin, all that was familiar to the dragon was no more; danger all around them. I think some danger might have occured to them, maybe right upon arrival! Upon arriving to Valrya, Balerion might have had to fight to survive. Considering the type of wounds, the fact that these wounds were still plain to see and not completely healed when he came back to King’s Landing, we are able to conclude that some fight occured during their stay in Valyria. We are also able to conclude that multiple fights might have happened at different points in time, because some scars were half healed, while other wounds were still bleeding at the time of Balerion’s return. These wounds Balerion suffered might have been the cause for both of them to remain in Valyria, at least until the dragon was healed enough to be able again to fly and get away from that horrible place! That would explain why both of them were in bad shape when they returned. Aerea would have suffered that much more in Valyria, but I don’t think that Balerion had a good time neither. This is my speculation: that both Balerion and Aerea suffered during their stay in Valyria, they both had to fight to survive, and that Balerion was somehow prevented to leave as soon as he would have liked to, so they both were exposed to many dangers while they waited for Balerion wounds to get better. Living in doomed Valyria might have been hard for the dragon, and sadly it proved to be fatal for the girl. As final consideration I’d like to add that it was probably Balerion that decided to return to King’s Landing (if dragons are able to somehow think and reason maybe he knew he would find help for him and the girl there), as we know that Aerea was too sick and feeble to command the dragon to do anything. A very sad story of how both the girl and the dragon suffered for falling into a trap they thought it might be home: Balerion place of birth gone to hell. “It is one thing to leap upon a dragon and quite another to bend him to your will, particularly a beast as old and fierce as the Black Dread. From the very start we asked, Where did Aerea take Balerion? 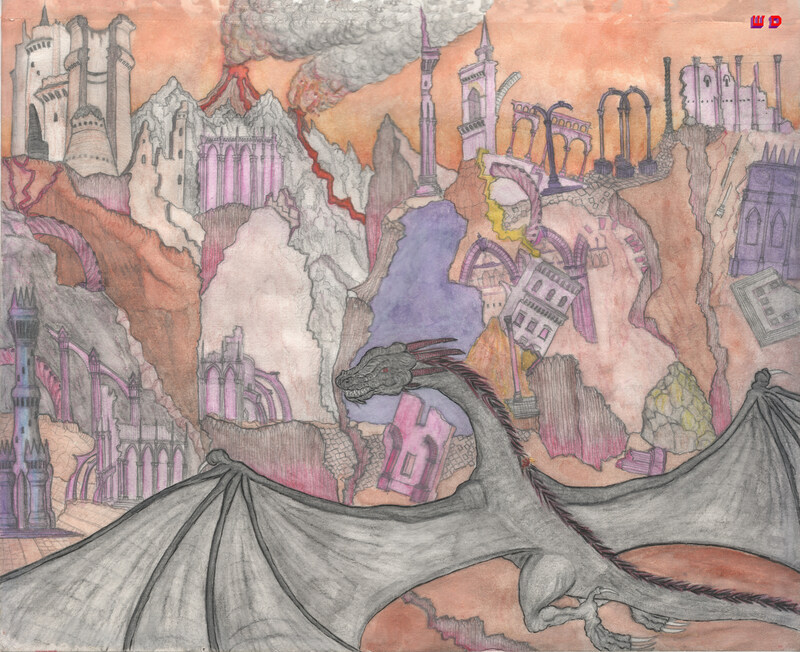 Balerion and Pricess Aerea Targaryen flying over Valyria. by Winter Design is licensed under a Creative Commons Attribution-NonCommercial-NoDerivatives 4.0 International License.